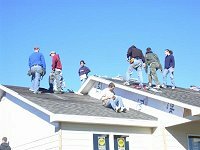 First Mennonite Church supports a variety of local agencies, programs, and organizations. Here is a partial list. 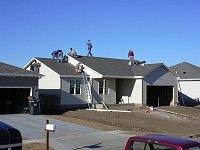 Church volunteers and donations help with the construction of Habitat for Humanity houses in the Lincoln area. First Mennonite Church is a member of the People's City Mission Lincoln Benevolence Coalition. Members volunteer in the Mission's programs as individuals and groups. The church provides financial support to the mission as well. The Nebraska Mennonite Central Committee Relief Sale is held on the first Saturday of April (and the preceeding Friday) at the Hamilton County Fairgrounds in Aurora, Nebraska. First Mennonite members enjoy creating items for the quilt and craft auctions and sales. All proceeds benefit the work of Mennonite Central Committee. First Mennonite Church provides volunteer and financial support for City Impact which serves urban youth, families and neighborhoods in Lincoln. The Lincoln Ten Thousand Villages store offers a beautiful selection of craft and gift items produced by fairly paid workers from around the world. First Mennonite People serve as board members and store volunteers.